Still well represented, the Parolin brand has just achieved more success at the second round of the WSK Super Master Series at Lonato. 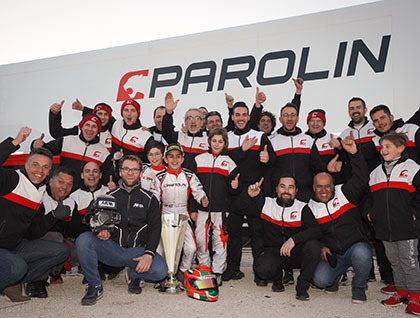 More than half of the 60 Mini finalists at South Garda Karting actually raced on Parolin chassis, five of which finished in the top ten. With pole position, 12 wins out of 15, two wins in the Prefinals, and the Final victory, the score is once again eloquent for the company from Bassano del Grappa. Gabriele Mini’ clearly dominated the OK category after his 2nd fastest time by brilliantly winning his four Qualifying Heats. He managed a remarkable recovery of 14 places in the Final and finished in 9th position, again one of the fastest on the track. Already a winner at Adria, Rashid Al Dhaheri repeated his feat at Lonato. 3rd fastest in Qualifying, he took the lead in the heats with three wins and two fastest laps of the race. As the battle became even more intense, Rashid won the Prefinal and triumphed in an epic fight up to the final metres of the Final. He therefore reinforced his lead in the provisional classification of the WSK Super Master Series. Keanu Al Azhari and Valerio Rinicella were in the top five in the Prefinals before losing their chances in the Final battles. Giovanni Trentin made a good debut with the team with three top threes in the heats and a gain of 12 places in the Final before a spoiler penalty. The OK-Junior drivers of the team were not celebrating as a result of disappointing Qualifying Practices and fierce clashes in the pack. Brando Badoer was forced to retire in the Prefinal, while Martinuis Stenshorne took a 9th position in the Prefinal and was in the top 10 of the Final with the second fastest time when he had to retire with a broken chain.